Trail Hero Adds Events Plus an App to Keep you Up To Date During the Event! The fun is 16 Days away! Are you ready for Trail Hero 2018? September 13, 2018, Hurricane, UT– Get ready for FUN at Trail Hero 2018! This year’s event has added the Rockin’ Golf Tournament at Sand Hollow Resort , adding something to do Tuesday afternoon for enthusiasts that arrive early for the Trail Hero off road event. Adding Tuesday to the event allows Trail Hero to have the first charity Rockin’ Golf Tournament benefiting Wheelers for the Wounded of Californa, and the event is brought to you by Yokohama Tire. In true Trail Hero fashion, this golf tournament is rock sports related. The Tournament will take place at Sand Hollow Resort and be held on the 9-hole Links Course, with added “off-road challenges” on the Wee Course, which is a par three course. Expect to have a tire chipping contest, “Happy Gilmore” style driving contest, and other challenges on the Wee Course. The tournament starts at 2pm. For the 9-hole Rockin’ Golf Tournament we will do a land rush start…. be prepared for anything..and everything. Big prizes including a hole-in-one will be included at the Rockin’ Golf Tournament. Registration is open for the Rockin’ Golf Tourney on the Trail Hero website. It is $50 to enter, and $5 per try at the Wee Course off-road challenges. 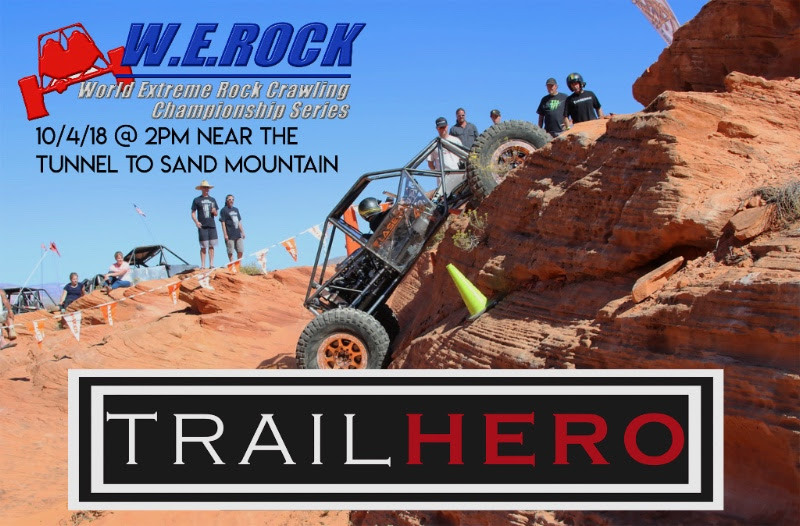 Directly after the Rockin’ Golf Tournament is the Trail Hero Kickoff Party at Sand Hollow Off Road. At the kick off party you can pick up your registration packet, grab a snow cone or coffee while you are there, or frosty cold beverage from our friends at Carbon Offroad. Kickoff Party starts at 5pm and is 3 miles away from Sand Hollow Resort and the Rockin’ Golf Tournament. 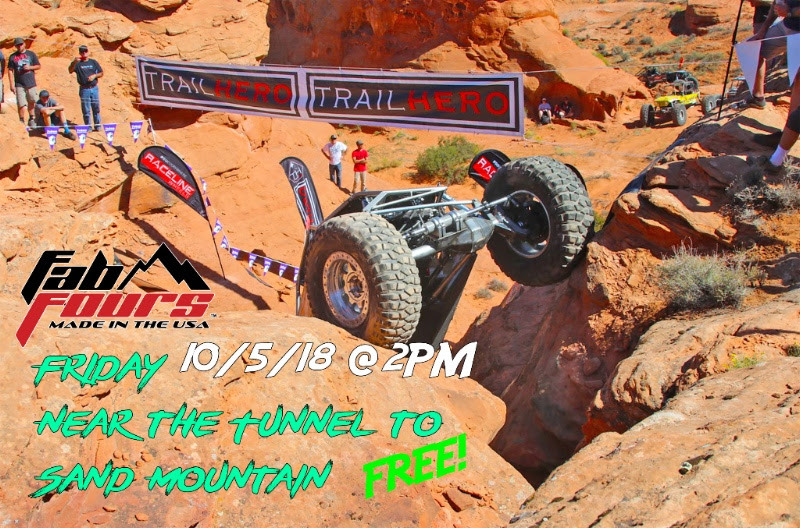 Starting on Wednesday Oct 3rd are Trail Hero’s guided 4×4 trails across the Hurricane Valley and at Sand Hollow OHV area / Sand Mountain, plus lets not forget the afternoon entertainment! Every day trails rated level 2 (mild) to extreme (11) leave from downtown Hurricane or from Sand Hollow State Park and adventure into the landscape that south west Utah has to offer. 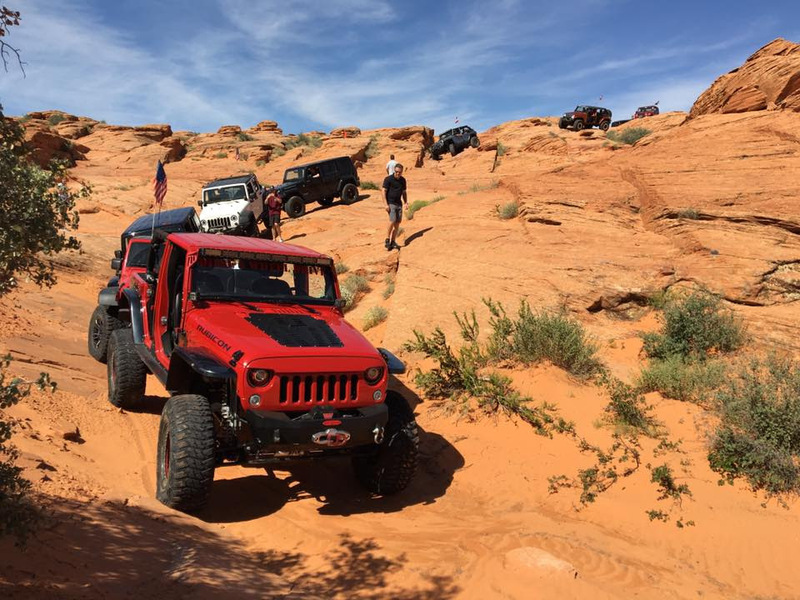 Redrock, sand dunes, and waterfalls make this an unique envoirment for every off-road enthusiast to enjoy their level of trail experience. From Toquerville Falls which is a beautiful scenic route to the waterfall above Toquerville, to the extremes of Arrowhead on Sand Mountain across from Sand Hollow State Park, the guided trails explore what Washington County has to offer the off road adventurist. 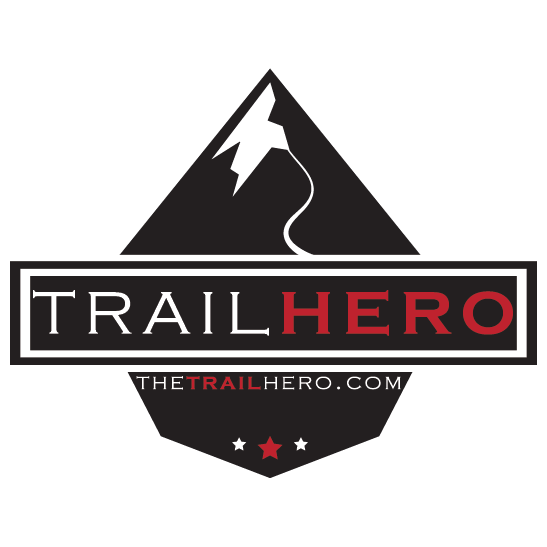 Trail Hero supports our Veterans and those with Special Needs and offers guided trails on Wednesday and Thursday of Trail Hero that explores Sand Mountain above Warner Valley. Trail Hero has trail rides honoring our Veterans on Thursday and those with Special Needs on Wednesday, and both trail rides feature a six-passenger vehicle from Zion Tours for those without a 4×4 that want to participate. The Special Needs Access trail and the Veterans Access trail are free for those that fall into either category. For the Veterans Access trail we do ask you show us your military ID at registration. Trail Hero’s Nitro Gear and Axle Ladies Run is headed to Milts Mile this year, a great trail through the heart of Sand Hollow OHV. The trail is rated a 6 and has some great obstacles for all types of vehicles. As if all of the new additions to Trail Hero were not enough, we’ve up the ante and added Southern Snow shaved ice available at The Chute obstacle on Double Sammy for anyone and everyone to enjoy a snow cone after their trail ride! GenRight Off Road, Artec Industries and Metal Cloak Industries will be buying Snow Cones for the first 40 customers on Wednesday, Thursday and Friday of Trail Hero, and of course, if you miss out they will take cash or card.. SNOW on the Mountain!!! 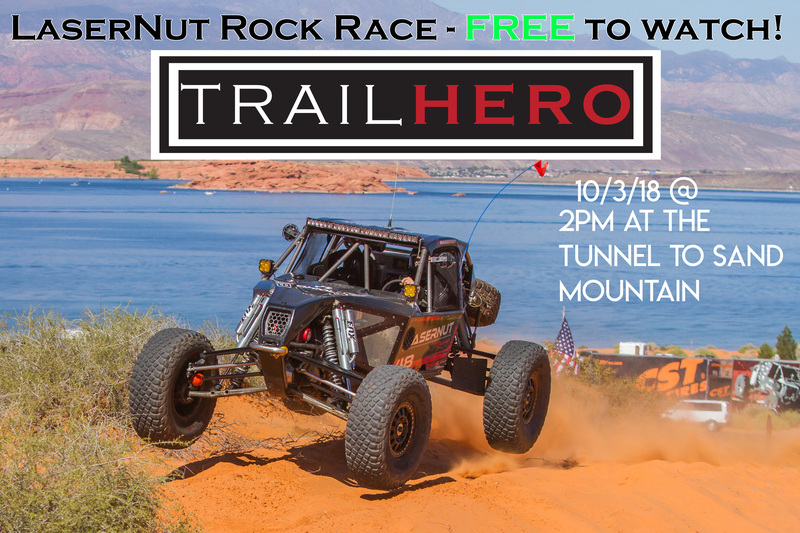 In true Trail Hero fashion, every afternoon starting at 2pm is a celebraton of all things 4×4 related to rock sports, and the events are FREE and open to the public to watch! The exhibitions are across Hwy 7 from the Sand Hollow State Park parking lot and tunnel, and are easy walking distance for those without a 4wheel drive vehicle. As if all of this was not enough, we have added an app to Trail Hero to keep you on track of the events throughout the week! Trail Hero now has the ablitiy to alert our attendees via our app whenever we need to notify of when an afternoon activity is happening, a change in the schedule, and it allows our attendees to upload photos of their experience at Trail Hero! To download the app, go to Yapp in your phone’s app store and download Yapp. Search For Trail Hero in the app to be connected. 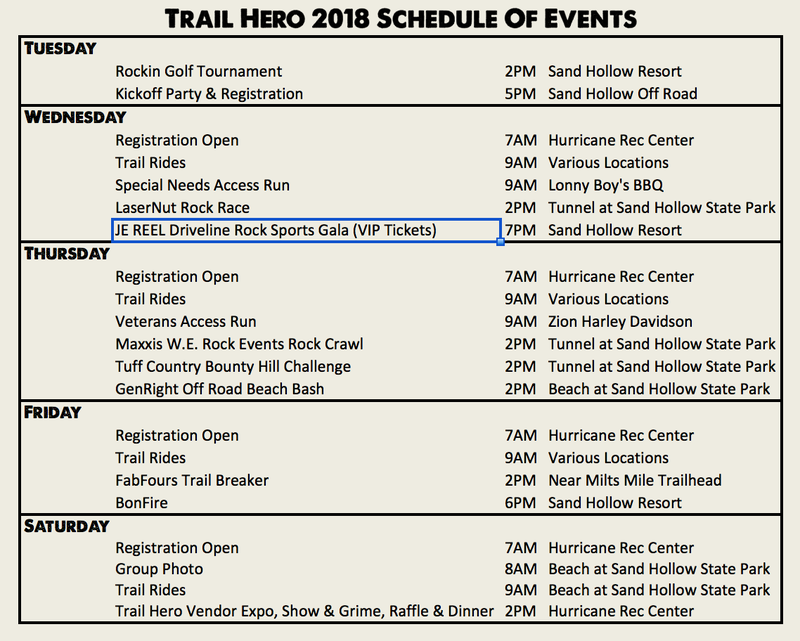 Can’t make it to Trail Hero 2018? No worries! During Trail Hero we will be bringing the event live to your screen on our Facebook page as well as our website. Next year we hope to see you here, in person, the first week of October for 2019 so you can enjoy all the fun! Trail Hero supports our public lands and proceeds from the event go to UPLA (Utah Public Lands Alliance) and U4WDA (Utah 4 Wheel Drive Association) to keep our public lands public. To register for guided trails or to find out more about Trail Hero, please go to www.TheTrailHero.com. Trail Hero trails at Sand Hollow OHV wind through redrock sandstone and sand. Extreme trails for buggy’s are pack a lot of fun into the day! The post New Trails & New Activities added to Trail Hero 2018 appeared first on race-deZert.com.